As one of the honorees and cover stars, Lady Gaga attended ELLE's 25th Annual Women In Hollywood celebration at the Four Seasons Hotel last night(October 15th) in LA. 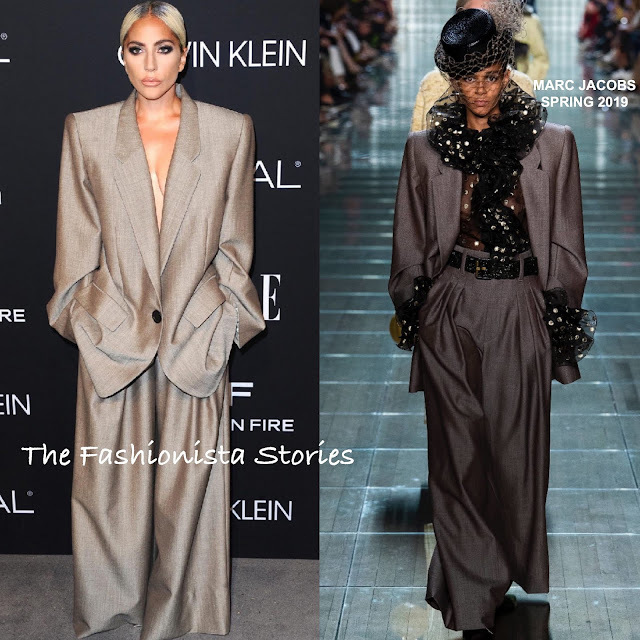 On tune with the grey carpet, she wore a grey MARC JACOBS SPRING 2019 over-sized blazer with padded shoulder and the matching wide-leg pants. The only other person that I can see pulling this off is Tilda Swinton or even Rihanna. You may remember that Riri wore an over-sized suit in May 2017 by a different designer. Lady Gaga was my favorite from this event and even thought the pants could have been hemmed, that doesn't over-shadow this winning look. Also I thought her beauty look was flawless. The over-sized suit was the perfect, modern take on the power suit look. Did Gaga win you over with this look as well? GIUSEPPE ZANOTTI sandals finished up her look.